Interests:graphic multiboot technology, grub, isoemu, xosl, freeldr. - your_lua_scripts to be used to control your menu system. - aero.sys+aeroboot.mod to run 'your_lua_scripts' at grub run-time. how about the AeroStudio's aeromgr.exe ? it is just a tool on this new framework. Let me explain for that. by using lua scripts, we can do many things, not only contol the whole system, but also user friendly, i think. yes, we can use this new script framework to render the traditional menu files generated by aeromgr.exe. on aerosim.exe stage, it used SDL to be the lower layer; on aero.sys stage, it used VESA to be the lower layer. the bridge is your lua scripts. If you used luaplayer on PSP, you should know what i'm talking about. this time, i'll prepare some docs to help you to use it, what had missed in aerostudio english edition. and here is a new site to achieve this purpose. 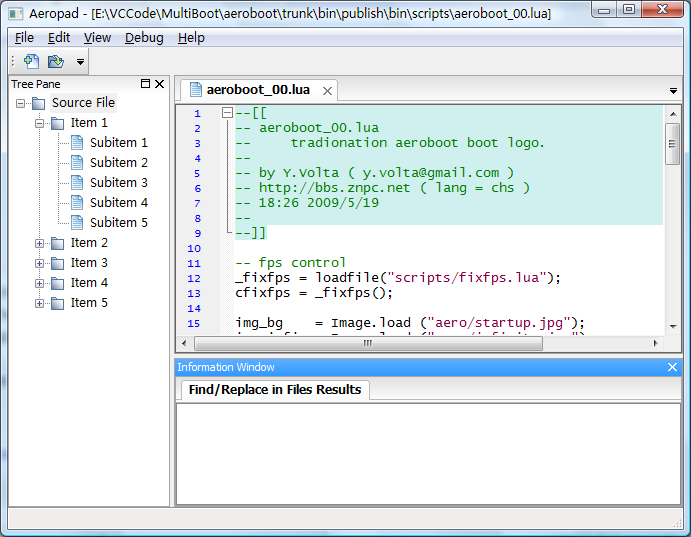 later, i'll release a package for this 'Aeroboot'. 1st, you should read the /publish/ReadME_eng.ini for quick guide. and, if you want to create your own scripts, you can refer to /publish/doc/en-US/API_Ref.pdf for api reference. there is still one function missing: there should be a tool to modify the aero.sys to set the depolyment media. this time, you should modify it manually by using a hex editor, e.g. winhex. - if you want to load your scripts from a hard disk partition, you should get its uuid and set it to aero.sys. later, i'll try to explain how to do so. Well, here is a new logo for aeroboot and aerosim. these days, i'm working on the lua script debuger. it is hard to me. today, i've finished the text encoding handling. my target is the Decoda. oh, this debuger is named Aeropad, it is a good replacement of notepad.exe i think. and, i used wxWidget as the toolkit. wait for me, i'll give you another useful tool not only a boot script debuger.